Gold Bond Coupon is a printable coupon available from Smartsource.ca. Visit SmartSource.ca, select the Gold Bond Ultimate coupon and print off the coupon. Bring in your printed coupon into any major retailer and you should be able to claim your $5 savings. This is a Gold bond coupon to save $5 on any one Gold Bond® Ultimate product (sized 127g, 160g, 368mL, 400mL or 411mL). Gold Bond coupon is valid only in Canada. You can find Gold Bond Ultimate is any drugstore and supermarket. 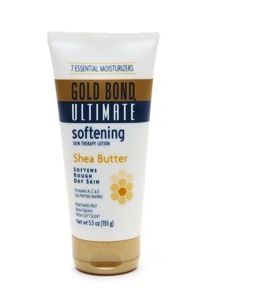 Gold Bond Ultimate Healing Lotion is specially formulated to help heal extremely dry, rough and problem skin. With seven intensive moisturizers and three essential skin-nurturing vitamins, plus the natural healing power of aloe, Gold Bond Ultimate Healing Lotion is clinically tested to moisturize for up to 24 hours. Dermatologist tested and hypoallergenic, Gold Bond Ultimate Healing Lotion has the power to get skin back to healthy, yet is still gentle enough to use on your face. It absorbs quickly and is non-greasy, yet you can actually feel it working even after you wash your hands! Hands, Cuticles, Feet, Elbows, Knees and Problem Patches on Legs, Back or Body.